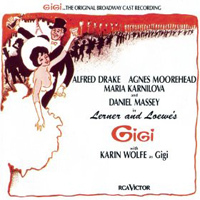 Original Broadway Cast, 1973 (RCA) (2 / 5) Here’s the cast album of a stage production that came 15 years after the film Gigi. The world had changed so much in the interim that the show seemed antiquated, aside from the flaws of the adaptation itself. The new orchestrations sound opaque and soporific; the production apparently had a kitschy, 1970-ish operetta look, and this album reflects that ill-advised concept, although some of the performances sparkle: Maria Karnilova sounds charming as Grandmama, Agnes Moorehead must have been riveting as the tough-as-nails ex-courtesan Aunt Alicia, and Daniel Massey is well cast as Gaston. Yet only Alfred Drake as Honoré seems fully at ease and in his element. Amazingly, he is able to dispel the ghost of Chevalier’s performance and offer a fresh characterization. While “Thank Heaven for Little Girls” will always conjure memories of Chevalier, Drake’s other numbers — including “I’m Glad I’m Not Young Anymore” and “Paris Is Paris Again,” the latter written specifically for the stage version — are highlights of the recording. The major drawback is the tepid title-role performance of Karin Wolfe, who displays none of the pluck and intelligence that are essential elements of Gigi’s character. — G.A. London Studio Cast, 1997 (JAY) (3 / 5) This well-done digital recording features Ron Moody (of Oliver!) fame as Honoré and the distinguished actress Sián Phillips as Mamita. Graham Bickley sings very well and gives an intelligent and vibrant performance as Gaston. Lindsay Hamilton is also quite charming as Gigi. It’s clear by everyone’s interpretation that this is still essentially a young women’s coming of age story. Moody’s vocal performance certainly leaves something to be desired, but all of the other music is well interpreted and performed. Several numbers are missing from the score of the 1973 Broadway stage version, including “The Earth And Other Minor Things,” “I Never Want To Go Home Again,” and “The Contract, ” but all of the more familiar numbers from the movie are included, and the large orchestra sounds excellent playing what sounds like the 1973 orchestrations enlarged a bit and with touches of the film orchestrations added here and there. All in all, the results are quite pleasant and lovely. — G.A. 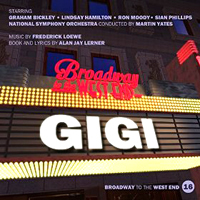 Broadway Cast, 2015 (DMI) (1 / 5) If you are looking for a good, new recording of the classic Lerner & Loewe score for Gigi, this isn’t it. In fact, what’s presented here is hardly recognizable as Gigi at all; lyrics have been added, deleted, or changed, seemingly arbitrarily, by an uncredited lyricist, and much of the music is amateurishly sung. 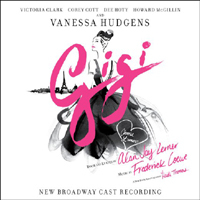 The more experienced performers — Dee Hoty, Victoria Clark, and Howard McGillin — come off well, but Vanessa Hudgens as Gigi and Corey Cott as Gaston are miscast vocally, and they don’t seem to understand the characters as created by Colette and adapted by Alan Jay Lerner. Hudgens’ Gigi sounds bratty and overbearing. Cott has a pleasant enough singing voice, but he sounds too young and sweet for the role, and his performance is devoid of contrasting emotions. More disastrous than the inadequate leading performances are the new and altered lyrics. Whoever did the rewrites chose to eliminate Gaston LaChaille’s problem of perpetual ennui by changing “It’s a Bore” to “It’s NOT a Bore.” Mis-scansion aside, the excision of this facet of the character means there isn’t much for Gaston to overcome. Reassigning “Thank Heaven for Little Girls” to Mamita and Aunt Alicia seems a rational choice for the modern age, but changing Gigi’s solo “Say a Prayer for Me Tonight” to Mamita’s “Say a Prayer for Her Tonight” throws the heroine’s dilemma completely off balance. Perhaps this was done to pad Victoria Clark’s role, but the new lines in the lyrics hardly have the good taste and polish of Lerner’s original version, and they fall awkwardly on what’s left of Loewe’s music. It’s arguable that Gigi needed a fresh approach to appeal to modern sensibilities, but almost every choice here makes you wonder why the producers even bothered to revive (or revise) this musical, rather than creating a new one. 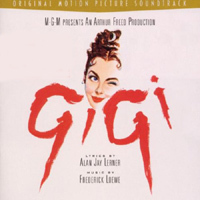 If Gigi can’t be successfully presented for a contemporary audience as written by Lerner and Lowe, better to have left it alone and allowed it to live on in the form of the beautiful film version. — G.A.